Cynthia Harrod-Eagles continues the Morland Dynasty series with the second of five books focused on World War I, each covering a different year. This book is set in 1915, and two of the Morland men are at the front, fighting in the Battle of Neuve Chapelle, the Second Battle of Ypres, and the Battle of Loos. Once again, Harrod-Eagles demonstrates extraordinary skill in battlefield writing, although I wished there had been a little less battlefield and a little more home front in the first half of the book. Unlike in The White Road, where Bertie is on the ground and Jack is in the air, in The Burning Roses both of the primary men are at the front and in the trenches, so the battles are similar. Other Morlands are serving in Malta and the Suez Canal, but we learn little about what they’re doing. Back in England, the Morland women and the handful of men who haven’t enlisted are finding their own ways to do their bit—charitable works, aviation, nursing. There are no big surprises there, but as always in this series, it’s the details and the attention to historical context that make the book work so well. What I love about this series is its thoroughness, the way Harrod-Eagles draws attention to so many disparate bits of history that I’ve rarely seen addressed all at once. Politics, medicine, engineering, art, social class, and marriage all get some attention. One of the things I found particularly interesting was the Germans’ first use of dirigibles and why they were so frightening. It’s hard to imagine being terrified by something the came so slowly, but it was the silent flight that did it. A dirigible flying at night could get all the way to London without being seen or heard. And at the time, there were no good weapons prepared to shoot them down. Of course, the Morland books always have some romance. The pace has now slowed so much that only a few of the romantic relationships undergo major shifts. The war does accelerate the trajectories of some of the romances, both for good and bad. The main heroine, Jessie, is not a favorite, and I’ve never been invested in her love story. I’m more interested in slow-growing passions than destined lovers thwarted by chance. 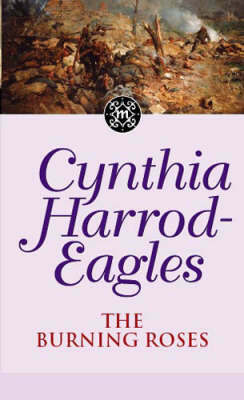 And I’ve long been irritated by the way Harrod-Eagles tends to bring such lovers together. So that’s a problem with this book and will probably be a problem that lingers for the rest of the series. However, in the grand scheme of things, it’s a small problem. There are so many characters and so much terrific detail that this particular complaint doesn’t reduce my pleasure much. The Burning Roses is not among my favorites of the series, but it’s a solid addition.